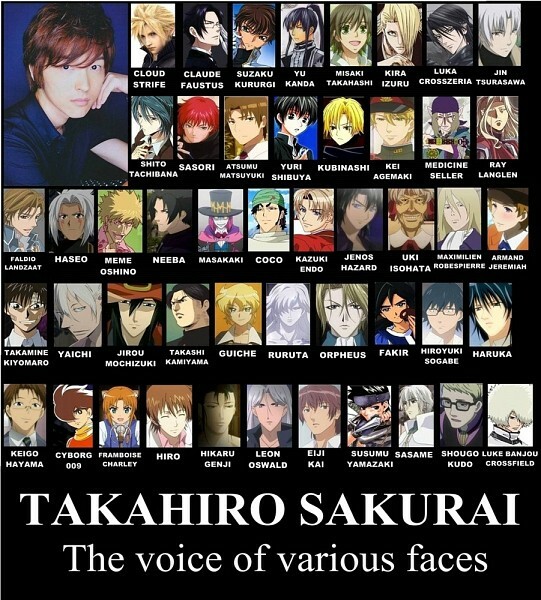 Takahiro Sakurai (櫻井孝宏 Sakurai Takahiro, born June 13, 1974) is a voice actor who was born in Aichi. He is a member of 81 Produce; his height is 1.76 m (5 ft 9 in). Many of his roles are handsome (and mostly charming) men. However, he has also voiced reluctant heroes (such as Mega Man X) as well as the occasional villain (Maximilien Robespierre in Le Chevalier D'Eon, Hiltz in Zoids: Guardian Force and Sasori in Naruto Shippūden). Sometimes, he is also typecast to play angsty and arrogant young men, and also loner characters such as Kira Izuru. More recently, he also provided the Japanese dub voice of Edward Cullen in the Japanese dub adaptations of the Twilight Saga films. He appears to have done a lot of roles with Kenichi Suzumura, for example in Final Fantasy VII, Black Butler, and Zombie Loan.